October 31, 2016 – This week, is Halloween, so we’re piling into the Munsters Car, cranking up the Dark Shadows music, and talking about two books that would fit neatly Morticia Addams’ nightstand. 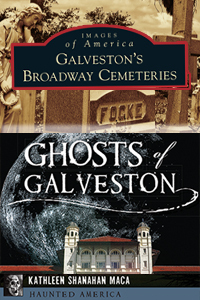 Our guest is genealogist and author Kathleen Shanahan Maca, who brings us Galveston’s Broadway Cemeteries, and Ghosts of Galveston. One of the oldest cities in Texas, Galveston has suffered many tragedies — hurricanes, yellow fever, fires, and a major Civil War Battle — and those who didn’t survive, started to fill its cemetery, starting in 1839. It’s also why people have a lot of fun with ghost stories, and use people’s fascination with things that go bump in the night, to preserve their very real history. You can visit this week’s guest at KathleenMaca.com, follow her @AuthorMaca on Twitter, and like her at Facebook.com/AuthorKathleenShanahanMaca — which you’ll certainly want to do if you enjoy old photographs of this great old Texas town on the Gulf Coast.